CMRS, Shri K.A. Manoharan, CRS/S. Circle, Bangalore along with his team will be inspecting the underground stretch of Phase 1, from AG-DMS to Washermanpet on 19-01-2019 and 20-01-2019. 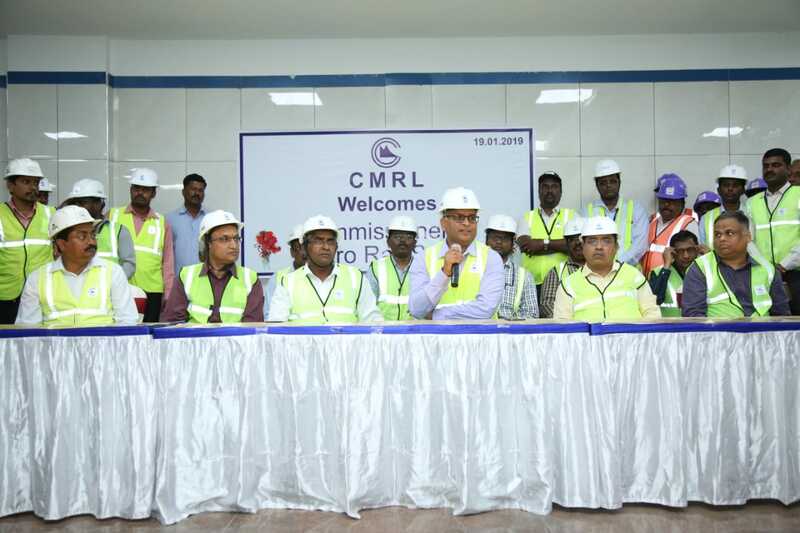 Chennai, Metro Rail News: The Commissioner of Metro Railways Safety, Shri K.A. Manoharan,CRS/S. Circle, Bangalore along with his team will be inspecting the underground stretch of Phase 1, from AG-DMS to Washermanpet on 19-01-2019 and 20-01-2019. Several Civil , operations and system readiness namely OHE height and stagger measurement, Demonstration of fire hydrant at Ramp Area, Demonstration of TVS Jet fans, Ramp Sump pump Inspection and Overview, Measurement of Schedule of Dimensions (SODs), Gauge, level and clearance measurement at every 200m intervals, Demonstration of Passenger Emergency Telephone (PET), Public Announcement (PAP) and Passenger Information Displays (PIDS),Lifts and Escalators, HV room and M05 room to name a few will be inspected during the two day inspection.